Fighting with the 3rd Texas Cavalry was a 22-year old Texan, Private Douglas John Cater, known for his love of music. Pvt. Cater enlisted in the Confederate Army at Henderson, Texas, in 1861 and fought through the Battle of Franklin. His record of service included many of the bloodiest battles: Wilson Creek, Chustenahlah, Pea Ridge, Jackson, Chickamauga, Missionary Ridge, Nashville and others. During his years of service to his Southland, Cater played in several brass bands and was brigade band captain of the last band of the Southern Confederacy. However, nothing would be more memorable than July 12, 1863, the day he strummed the keys of a fine grand piano in the Confederate trenches around Jackson. How he discovered the piano is a captivating story. "On the 10th of July, a call was made for volunteers to sharpshoot in front of our position," Cater reminisced. "Five of us in the squad volunteered to go. We took position in a clump of trees not far from Colonel Cooper's residence. This was a fine two-story house. His family had moved out but had left their furniture, carpets, mirrors and a fine grand piano." The Cooper House was of interest to both armies, Confederate and Union, because it housed a cistern full of fresh, cold, water. With water a rare commodity, the armies fought for possession. Finally, in an effort to distract the Yankees' attention from the cistern, General Joe Johnston ordered that the house be burned. The thought of that fine piano going up in flames was more than Cater and other members of his regiment could stand. "I went back there with others after nightfall," stated Cater, "and carried away a little piece of broken mirror and about a yard of Brussels carpet for use in camp. Some men from Slocomb's Battery (Confederate) took the piano to the breastworks. Our regiment was just on the right of this battery facing the enemy. The piano was near the cannon but was protected by the breastworks." and the troops enjoying a musical moment in the trenches around Jackson. Click on image for more information on Jerry McWilliams. Day and night, sounds of piano music filled the air while Pvt. Cater sat in the trenches playing all of the familiar tunes of the day - Dixie, O I'm a Good Old Rebel, and The Bonnie Blue Flag. His brother, Rufus, as well as other members of the 3rd Texas and Slocumb's Battery, hung over his shoulder, singing along as he played. Undoubtedly, the Union army, a short distance away, enjoyed the music as well. On July 12, the merrymaking from the piano in the trenches spiraled out of control. As Cater played, everyone gathered around oblivious to the enemy facing them in the trenches close by. 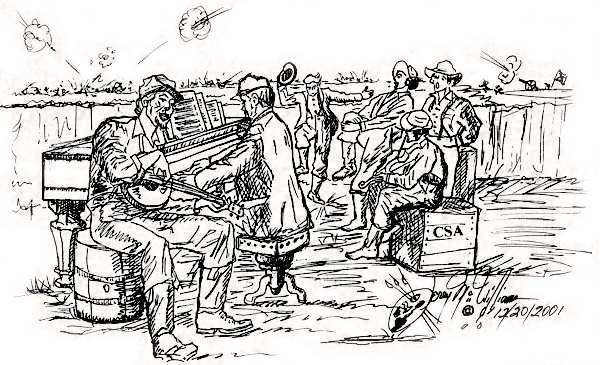 "We were enjoying the music and paying no attention to the shells and Minnie balls which were passing over us," recalled Cater, "when Captain Slocomb, standing near the piano, caught the sound of the Federal yell, and looking over the breastworks, saw them coming on a charge. He was at his guns and brother Rufus and I were back at our posts with the regiment quicker than the time it had taken to write of this incident. On they came. We had reserved our fire until Slocomb's Battery opened fire on them. It seems that this was the signal for an attack all along the line but it met with such fearful slaughter that they retired out of the range of our guns. Our brigade commander General Dan Adams mounted the breastworks and fired two rounds with a musket of one of our company men. We took 150 prisoners in front of our brigade, who would not attempt to fall back under the fire of our muskets." Smoke was still heavy in the air when Cater returned from the assault on the enemy. Seeking his beloved piano he resumed playing. The men jumped back in the trenches and began singing along. As they serenaded the night air, Captain Slocomb admitted when he heard the Union yell coming toward them he feared that he had let the Federals get too close. Pvt. Cater later wrote, "Two hundred and sixty soldiers lay dead a short distance from Slocomb's Battery and our regiment in front of our breastworks. This number added to the 150 prisoners and 160 wounded made a loss of 570 from the division that charged us. So great was the stench of death that an armistice of several hours was agreed to in order to bury the dead." Several days later, after the city of Jackson fell to Federal forces, Pvt. Cater continued on with the 3rd Texas Cavalry and fought through the remainder of the war. His beloved brother and fellow music-maker, Rufus, was killed at Chickamauga. Pvt. Cater was mustered out in 1864 and resumed civilian life in Lovelady, Texas. Actual piano played by Pvt. Cater in the trenches of Jackson. 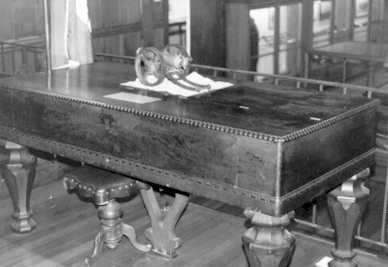 The piano is on permanent display at the Confederate Museum in New Orleans. Pvt. Cater's friend, Captain Slocomb, was also mustered out having survived the entire war. In 1867, during a trip to New Orleans, Slocumb was pleasantly surprised when his former comrades presented the battle-scarred piano from the trenches in Jackson to him as a gift. Today, the old piano, still riddled by bullets and Minnie balls, is housed in a museum in New Orleans where it serves as reminder of the joys of music even during times of war. In the years following the war, Douglas John Cater worked as a postmaster and a rancher. However, music remained his greatest love. In the years prior to his death, he shared all of his recollections of the war with his children and grandchildren. These wonderful and colorful recollections were later put into book form and named, As It Was: Reminiscences of a Soldier of the Third Texas Cavalry and the Nineteenth Louisiana Infantry. The old Confederate veteran died in 1931 at the age of ninety. *Captain Cuthbert Slocomb was commander of Slocumb's Louisiana Battery. The men in his battery were educated, propertied men (occasionally referred to as the "silk stocking" unit) who had known each other prior to the war. For the history of Southern Cedars or to view other artwork by McWilliams visit SouthernCedarsGallery.com.